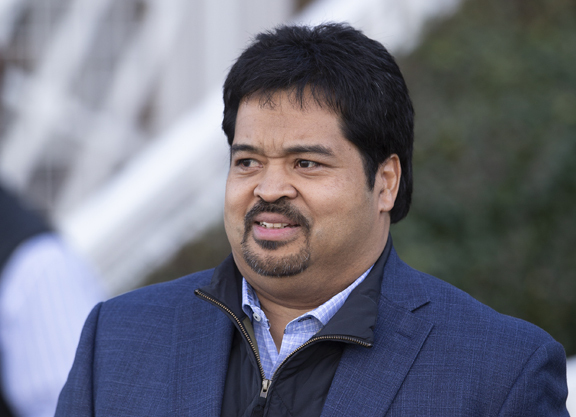 Last weekend marked the arrival of Santa Anita’s latest vice president of racing and racing secretary, Steve Lym, who had journeyed south after 43 years at Woodbine. A horseman for the first 11 years there, he trained for a period in the late 1980s–Lym was an employee of the track in various capacities for the other 32. He last held the position of Woodbine’s director of racing. Lym has sat on numerous international boards and committees, including the Breeders’ Cup Selection Panel, the International Federation of Horseracing Authority World’s Best Racehorse Ranking Committee, the North American Ratings Committee and the Canadian Graded Stakes Committee. It’s his role, however, as Woodbine’s former racing secretary that probably best prepares for the sometimes thankless task of trying to appease both the horsemen and the racetrack itself. The following is a version of our conversation Thursday, edited for brevity and clarity. TDN: You’ve mentioned in interviews that you’re looking for a “balanced” program. Can you elaborate? Some have taken that to mean more cheaper races. SL: I keep using that word “balanced.” But can cheap horses survive in California? No, I don’t think so. So, as much as we’re trying to have a robust program with big fields, we have to be careful how we accomplish that. TDN: You’ve also compared the similarities in the business models between Woodbine and Santa Anita. What are those similarities? SL: At Woodbine, we have a strong horseman’s group you have to deal with, like here. We have a similar breeding program where it’s away from everything. Woodbine also has some big owners and some big trainers where it’s hard for the average guy to compete against. I think that’s somewhat similar here. [At Santa Anita you have] some outfits that are big, and there’s lots of horses–well bred, high-powered horses that the average guy can’t compete against, and you’re looking for the Cal-bred horse to even out the field. I think I have the experience managing that. At the end of the day, we just want bigger fields–somewhere the smaller outfits get the chance to win plenty of races. TDN: Interesting you mention that. One of the things Santa Anita recently instituted was a different purse distribution model, designed to give smaller trainers a larger slice of prize money. What are your thoughts on the inherent tension between larger and smaller stables? SL: [At Woodbine] we have trainers that have gotten bigger, and a lot of smaller trainers have gone out of business. California seems to be the same. To be honest and truthful, I don’t know the best way to counter that. I don’t think you can tell [owners] who to go to. I think what we need to do is encourage the big trainers to run their horses, and if they can’t, then we’re going to take measures. But I’m not looking to take business away from anyone. 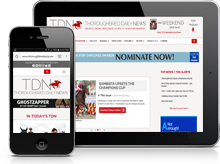 TDN: One of the things frequently bandied around is the idea of a tighter stall limit. Would that work to level the playing field? SL: We went the other way [at Woodbine]–we increased the stall limit. And the reason we did that was, if you have 2,000 stalls and 4,000 applicants, stalls wise, then yeah, you can have a limit, depending on how many trainers you have. Again, you can’t dictate to owners who they give horses to. But it seems like here, there’s not enough demand for stalls. We give out every stall here, plus the overflow at San Luis Rey [Downs] and Los Alamitos. But is still seems like there’s empty stalls here. Not mentioning names, I’ve seen where they’ve given out 30 stalls to a trainer, and now they have 10 [stalls] empty. What do you do in a situation like that? If you give 40 stalls to someone, and there’s 10 stalls empty beside them, and they’ve got 20 horses at Los Alamitos, and they want to bring in 10 extra horses, then there’s 10 extra horses we can pull from and take entries on. To me, it would depend on demand. I would lean towards limiting stalls, but I think it’s impractical right now. What we need to work on is how to get new outfits out here. If we don’t have enough competition here, then we have to work on getting people in here–just like Del Mar. The more trainers here, the better it is, obviously. What we need right here is buy in from everyone–there’s not a single management [strategy]. We need the horsemen and the horseman’s associations to buy in–it’s a partnership. We’re trying to create an environment where we have better fields, more opportunities, better betting prospects for the customer. TDN: Ok, so what can you do to make sure the horses stabled here run here, and that you get maximum efficiency from your inventory? SL: That’s right in my wheel-house. That’s where we need to make some changes. We’ve just put something in the overnight tonight that says anybody who wants to enter a horse outside of Santa Anita must get permission from us first. We do not put any disciplinary action on this. We want to make sure that when someone says, ‘I have to go away because there’s no race,’ that there actually is no race for them here first. We’re not going to stop Justify running in the Kentucky Derby. The second step is to maximize our horse population. We know exactly what we have on the backstretch. We know you have 40 horses here, and we know what class those 40 horses are. And so, if you have six maiden special weight horses in your barn and we have a maiden special weight, the horses have all worked a week before the race, but you’re not running in it, why is that? We’re going to phone you, and we’re going to ask. [And so], we’re going to put a matrix in to rate trainers on their performance based on starts per stall and how much money they make per stall, so we can see who’s participating and who’s not participating in an orderly detailed fashion–not just, ‘hey, that guy doesn’t run many horses.’ We can quantify it with numbers how you’re doing, and we will show you that data. TDN: Did you institute that at Woodbine? SL: About 10-12 years. We grade trainers in quartiles. Top quartile trainers are good customers, and they get the stalls they need and want. If you’re a high-profile trainer and you’re at the bottom of the quartile, even though you have lots of horses, then we’re going to take a look at stall allotment and act accordingly. TDN: This system is contingent on having a good handle on your inventory, right? SL: I’m going to bring some different things in here to measure that more precisely. At Woodbine, I developed a system through [The Jockey Club’s] InCompass. At the push of the button, you could categorize 3,000 horses in three minutes. It would give you a list of horses, whether they’re on the grounds, their class, whether they’re state-bred or not, last race, last work-out, distance. TDN: In saying that, we’ve lost multiple training facilities like Hollywood Park and Pomona in recent years, and all trainers, but especially some of the trainers who naturally take longer preparing horses, are now pretty restricted in where they can do that conditioning. Do you also factor that side of things when you’re putting trainers into quartiles? SL: Yes, we did that at Woodbine, and I think we’ll do that here. So, again, we don’t want people to hurt horses. We don’t want people to rush horses. That’s not what this is about. This is [targeting] someone who’s going to have a horse at the racetrack for seven months getting ready for a race. You don’t need that long to get a horse ready. But we’re not trying to be unreasonable. There are setbacks–horse gets sore-shins, has to start all over again. But we’re looking for the unreasonable. Some trainers take a long time to get ready, some trainers take an awful long time. I am asking them to be efficient and run their horses when they’re ready to run. TDN: How did you manage this quartile system with the horsemen at Woodbine? Were you hands on? SL: The racing office is on the backstretch. Did I walk the backstretch? I wouldn’t say I walked it every day, but my office was always open–I had a good relationship with the horsemen. I would think I was fairly popular. If you’re talking baseball management style, I was a player’s coach. I think my job is to help make the track be profitable and do all the right things to make money for the racetrack, but if the horsemen don’t make money, you’re in trouble, too. TDN: What did the horsemen at Woodbine think about the system? SL: They understood why that was because one of the things we did, we posted it, so you could see where you are, how you’re doing. TDN: What would happen to those in the bottom quartile? It would also help the small guys looking for stalls. If we saw a guy with four or five stalls, and the first year he’s in the top quartile, he’d get one or two stalls extra. And if he did it again, we’d say, ‘wait a minute, this guy is on the move.’ We’re inclined to help him. Sometimes it goes the other way. My time as racing secretary, I don’t think I dipped below 8.8 [field size] average. We even had a couple years where we were plus nine, and that’s for a 130- to 140-day meet. TDN: Interesting you mention that. Research out of the University of Louisville proved that at Woodbine, handle positively correlated with field size, to an extent. SL: Our [former] vice president at Woodbine, his hypothesis at the beginning was field size, field size, field size. And we found out, that wasn’t exactly the case. It’s field size plus quality. Regardless of whatever anyone says, we know that big fields with good horses get bet more than just big fields. If you get an eight-horse field with good horses, they’ll bet more on that than a nine-horse maiden claimer for cheap. TDN: What are your thoughts about Santa Anita’s “ship and win” program? And do you think the “ship and win” programs at Woodbine would fit the mold here? SL: We didn’t have the greatest success with those ones–it could have been too early [to tell]. We’re going to try to run more turf races here [at Santa Anita], and we need to know what we can offer to get trainers to come here. The first is a more even program–not necessarily a cheap program, but one with more races, including more opportunities on the turf. There are certain things more prevalent in some jurisdictions than others. I think training horses in California is expensive, I think living in California is expensive, and you have to take that into account of how horsemen are. TDN: A number of graded stake races at Santa Anita were downgraded last year. How concerned are you about that? SL: I think that’s a trend everywhere–maybe highlighted a little more here. Yes, there’s a slide in quality here. TDN: How do you reverse that trend? SL: Good question. It’s the health of the industry overall. The strength of the breeding product. People racing their horses here. Obviously, if Chad Brown brings some horses here, it’s going to increase the quality. Same with Todd Pletcher. Listen, some of the best horses come from California, so there’s no doubt that we have good horses here. We’ve got to get them to come here and stay here, because, if you have the one good horse and he beats everyone by 10 lengths, that race doesn’t look like a true Grade I–it looks like an average race with a Grade I horse in it. TDN: Are you going to actively petition trainers to come here? SL: We’re hanging a sign that we’re open for business. We are definitely open to anyone who wants to come and race here, and we will encourage them, and we will help them acclimatize and settle into the California way of racing. We’re going to create an environment where we treat our local guys well, but we’re accepting of people who want to come here and race and help our product. TDN: At Santa Anita, historically there has been a relatively high turn-over of personnel under the Stronach Group. Will that affect the way you do your job? SL: No, I’m going to give it all that I have. Obviously, I’m going to try to accomplish what they need to accomplish. I want California racing to prosper while I’m here, and I think we will. And you’ve got to remember, [former racing secretary] Rick Hammerle was here for 15 years, so I don’t think that’s a big turn-over. I’m confident in what I can offer Stronach, and I’m confident that we’ll make California racing better.